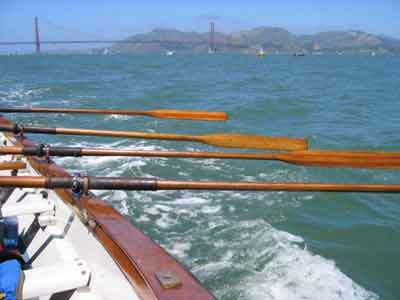 Race Course: A one-mile race from the south east corner of Alcatraz Island to Aquatic Park in San Francisco Bay. 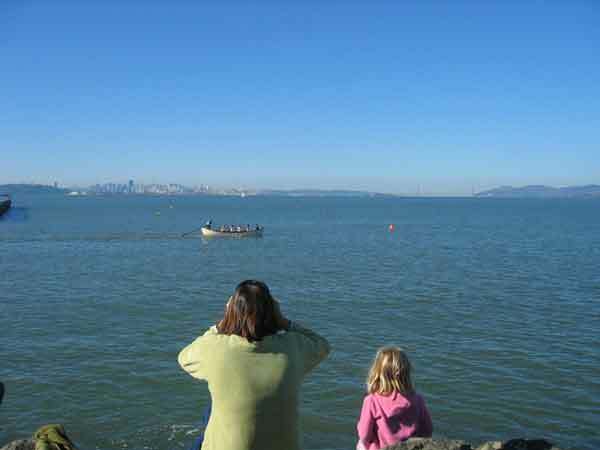 Best Viewing: Municipal Pier at Aquatic Park. 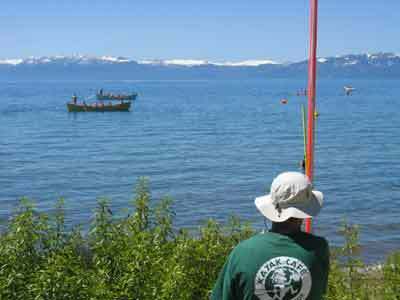 Awards Location: Aquatic Park, across from the Sea Scouts Base. 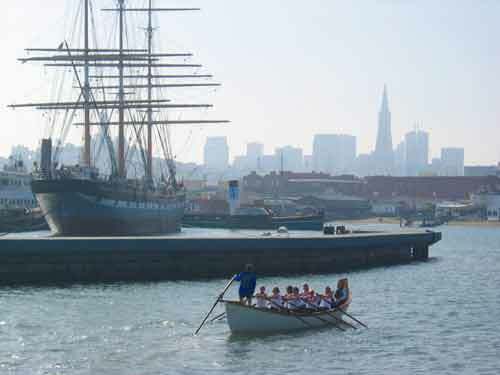 Aquatic Park is within the San Francisco Maritime National Historic Park. It is located at the foot of Van Ness Avenue north of North Point St. Park along Van Ness. If Traveling from the South: Take Highway 101 North. Follow the signs to 101 North Golden Gate Bridge. Take the Mission Street exit, and at the bottom of the ramp go right on Mission St. In two blocks go left on Van Ness Avenue, and follow Van Ness Avenue north about 30 blocks to North Point St. and the entrance to Aquatic Park. If Traveling from the North/Golden Gate Bridge: Take Highway 101 South to Marina Blvd. Turn left on Bay St. and left on Van Ness Ave. The next intersection is North Point St. and the entrance to Aquatic Park. If Traveling from the East Bay/Bay Bridge: Take I-80 West to the first right exit over the bridge, Fremont St. At the bottom of the ramp turn right (north). Turn left onto the Embarcadero and continue to approximately Pier 33 to turn left onto Bay St. From Bay St. turn right onto Van Ness Ave. and the next intersection is North Point St. and the entrance to Aquatic Park. Click here to create your own driving directions to/from Aquatic Park. 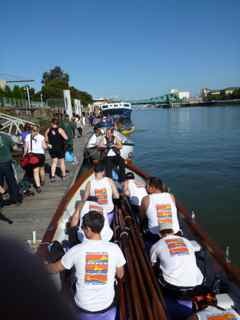 The Bay Area Whaleboat Rowing Association (BAWRA) kick-off party in the spring sets the right tone for whaleboat racing. Food, beer, dancing and lane draws. Don�t miss it! The party location may change from year to year, so check the Schedule page for the latest information. Race Course: A five-mile race from the Golden Gate Bridge to the Bay Bridge in San Francisco Bay. Best Viewing: All along the San Francisco Waterfront. Best hills: In the Presidio along Lincoln Avenue, Fort Mason bluffs, Coit Tower. Best waterfront: Crissy Field, the Marina Green, Municipal Pier at Aquatic Park, the end of Pier 39, the end of Pier 1 and the Ferry Pier at the Ferry Building, the Port Promenade. Awards Location:See current year race information for Awards location. Race Course: Head style race about a mile and a half around Coast Guard Island in the Oakland Estuary. Best Viewing: From Coast Guard Island, Union Point Marina, the causeway to Coast Guard Island, along Embarcadero in the regional park with benches and a pier. Awards Location: The awards are usually somewhere on Coast Guard Island (technically in Alameda, the island is only accessible by land from Oakland). See the current year information for a location. You may be asked ahead of time for a contact name for your club, and/or the names of every guest you plan to bring on the island. You will need a picture ID for access to the Island and proof of car insurance if you drive onto the island. If Traveling South on I-880: Exit at 23rd Ave. (also marked at street level "Coast Guard Island") and take a sharp right onto Dennison St. The first stop sign is at Embarcadero, where Dennison turns into the causeway to Coast Guard Island. If Traveling North on I-880: Exit onto 23rd Ave and make a u-turn at the first available chance (11th St.). Once over the freeway, turn right at E 7th St. which turns into Embarcadero. Turn left at Dennison St. and go over the causeway to Coast Guard Island. Click here to create your own driving directions to/from Coast Guard Island. Race Course: A half-mile sprint on a "Z" course in front of the Bay View Boat Club in San Francisco Bay. Best Viewing: The Bay View Boat Club. Awards Location: The party is at the Bay View Boat Club, 489 Terry Francois Blvd (aka China Basin Street) / Pier 54 in San Francisco. Parking is available in the lot or on the street. If Traveling From the South: Take 101 or 280 north and get on 280 north to Downtown. Take the Mariposa Street exit, and at the bottom of the off-ramp go right on to Mariposa Street. Go through the next two lights (3rd Street and Illinois Street). As the road curves left, you are now on Terry A. Francois Blvd. In about 1/4th mile on the right is a yellow building with "BAY VIEW BOAT CLUB" in big letters on the side. If Traveling From the North/Golden Gate Bridge: Take Highway 101 South/Golden Gate Bridge to the Marina Blvd. exit. Continue on Marina Blvd. past Fort Mason and turn left onto Bay Street. Continue on Bay and turn right onto the Embarcadero. Continue on Embarcadero until you pass the AT&T Baseball Park (you are now on King Street). Turn left at Third St. over the bridge and take the next left onto Terry A. Francois Blvd. In 1/8th mile on the left is yellow building with "BAY VIEW BOAT CLUB" in big letters on the side. If Traveling From the East Bay/Bay Bridge: Take I-80 West over the Bay Bridge to the first left-hand exit, Fifth Street. Exit onto Harrison Street, then turn left onto 6th Street and continue onto I-280 South. Take the first exit at 18th Street and turn left onto 18th Street. Continue over the freeway to Third Street (first light). Turn left on Third Street to the next corner (Mariposa) and turn right. You are now on Terry A. Francois Blvd. In about 1/4th mile on the right is a yellow building with "BAY VIEW BOAT CLUB" in big letters on the side. 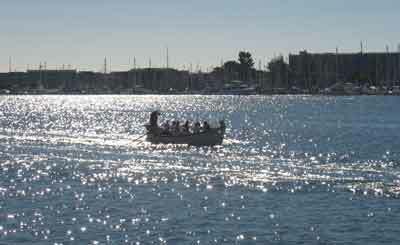 Click here to create your own driving directions to/from the Bay View Boat Club. 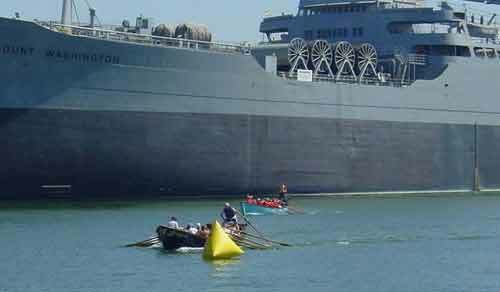 Race Course: A three mile head race in the Oakland Estuary. Best Viewing: Depending on the course used: High St. Bridge, Shoreline and the public park and pier between High St. and Fruitvale Ave. Bridges, Park Bridge, Union Point Park. Awards Location: Union Point Park, on the Embarcadero between Dennison and Kennedy, in Oakland. Please note: Do NOT park at Union Point Marina -- let the residents park there on race day! If Traveling South on I-880: Exit at 23rd Ave. (also marked at street level "Coast Guard Island") and take a sharp right onto Dennison St. The first stop sign is at Embarcadero, where Dennison turns into the causeway to Coast Guard Island. Turn left on Embarcadero, and the parking lot for Union Point Park is about 150 yards on the right past the entrance to Union Point Marina. If Traveling North on I-880: Exit onto 23rd Ave and make a u-turn at the first available chance (11th St.). Once over the freeway, turn right at E 7th St. that turns into the Embarcadero. Once you see the water, the entrance to the Union Point Park parking lot will be on your left. Click here to create your own driving directions to/from Union Point Park. 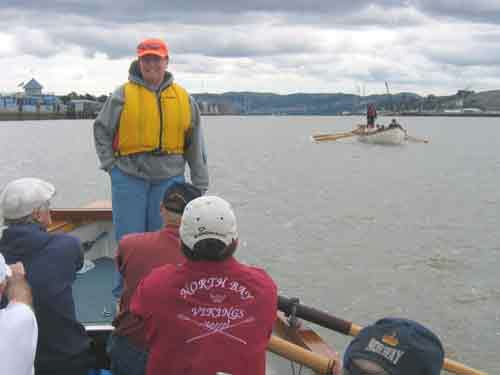 Race Course: One-mile race in the Oakland Estuary. Best Viewing: (Channel) Estuary Park on Embarcadero between Fallon and 5th Ave. in Oakland. Awards Location: At the end of the pier at Estuary Park. Use the Jack London Aquatic Center (JLAC) parking area at 115 Embarcadero. This is approximately one mile east of Jack London Square. If Traveling South on I-880: Exit at 16th Ave. and turn right onto Embarcadero. Go approximately a mile on Embarcadero, over a small bridge, and immediately after the bridge turn left into the entrance to Estuary Park and the JLAC parking lot. If Traveling North on I-880: Take the Oak St. exit. Turn left onto Oak, going back under the freeway toward the bay. Oak becomes Embarcadero after crossing the railroad tracks. At approximately 3/10 mile, turn right into the entrance to Estuary Park and JLAC. Immediately after the JLAC entrance there is a small bridge on Embarcadero; if you go over the bridge, you've gone too far. Take the 5th Ave. exit. Turn right onto Embarcadero. Go approximately 2/3 mile on Embarcadero, over a small bridge, and immediately after the bridge turn left into the entrance to Estuary Park and the JLAC parking lot. DO NOT TAKE THIS EXIT IF YOU ARE DRIVING A BOAT TRAILER!! Click here to create your own driving directions to/from JLAC/Estuary Park. Race Course: Sprint in McCovey Cove. 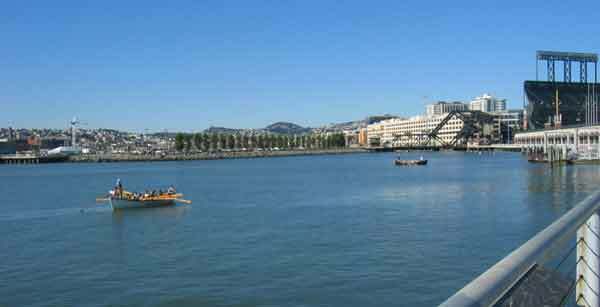 Best Viewing: McCovey Point at China Basin Park, and the south side of AT&T Park. If Traveling From the South: Take 101 or 280 north and get on 280 north to Downtown. Take the King Street exit, and then turn right on 3rd Street. Go over the 3rd Street Bridge (Lefty O'Doul Bridge) and take the first left onto Terry A. Francois Blvd. Go to McCovey Point, just as Terry A. Francois Blvd turns to the right.. If Traveling From the North/Golden Gate Bridge: Take Highway 101 South/Golden Gate Bridge to the Marina Blvd. exit. Continue on Marina Blvd. past Fort Mason and turn left onto Bay Street. Continue on Bay and turn right onto the Embarcadero. Continue on Embarcadero until you pass the AT&T Baseball Park (you are now on King Street). Turn left at Third St. over the bridge and take the next left onto Terry A. Francois Blvd. Go to McCovey Point, just as Terry A. Francois Blvd turns to the right.. If Traveling From the East Bay/Bay Bridge: Take I-80 West over the Bay Bridge to the first left-hand exit, Fifth Street. Exit sharp left at 5th Street, then left at Townsend Street. Take a right at 4th Street, and left on King Street. and then turn right on 3rd Street. Go over the 3rd Street Bridge (Lefty O'Doul Bridge) and take the first left onto Terry A. Francois Blvd. Go to McCovey Point, just as Terry A. Francois Blvd turns to the right. Click here to create your own driving directions to/from McCovey Point. 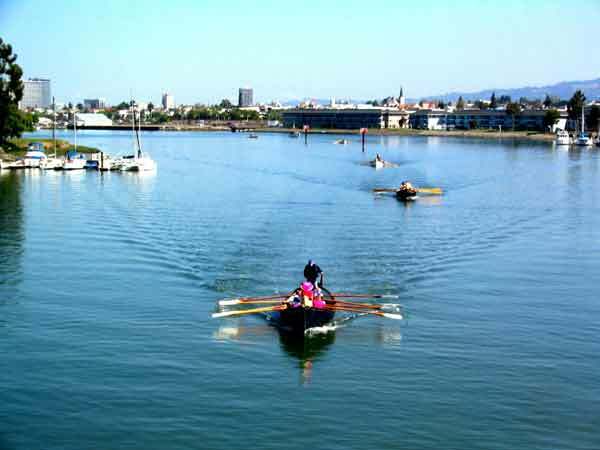 Race Course: A two-minute sprint between Hyde Street Bridge and Fruitevale Bridge in the Oakland Estuary. Best Viewing: From the parking lot behind Nob Hill Foods, 2351 Blanding Ave. (between Broadway and Everett Streets), Alameda, Ca. Awards Location: See current year information. If Traveling South on I-880 (via the Park Street Bridge): Take 23rd Street exit (Kennedy), Follow 23rd Street over the Park Street Bridge to Alameda. Turn left on Blanding Ave. Nob Hill Foods is on the left. If Traveling North on I-880: Take 23rd Street exit. Make a u-turn at the first available chance (11th Street). Go back over the freeway to Park Street Bridge. After crossing the Bridge, turn left on Blanding Ave. Nob Hill Foods is on the left. Click here to create your own driving directions to/from the Nob Hill Foods. 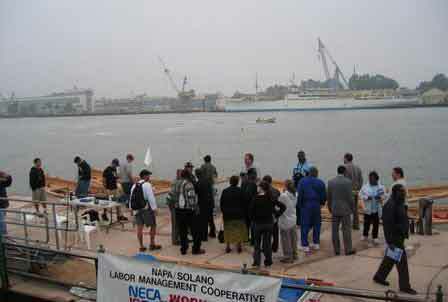 Race Course: An "M" course on Mare Island Channel along the Vallejo Waterfront Promenade. Best Viewing: Just north of the Vallejo Ferry Terminal. Awards Location: Zio Freddo's Restaurant. If traveling North on I-80: Immediately after crossing the Carquinez Bridge, take the first exit on the right (it comes up fast) onto Sonoma Blvd./29. After about 2 miles, turn left on Mare Island Way (called Curtola Parkway on the east/right side of Sonoma Blvd.). Right after you pass the Vallejo ferry docking area and the Ferry Terminal on your left, park wherever you can, walk to the water and look for people in spandex..
Alternate route: Once over the Carquinez Bridge, take the I-780 exit toward Martinez/Benicia. Keep left at the fork, follow signs for Vallejo and merge onto I-780 W. Continue on Curtola Parkway, which turns into Mare Island Way. Right after you pass the Vallejo ferry docking area and the Ferry Terminal on your left, park wherever you can, walk to the water and look for people in spandex. Click here to create your own driving directions to/from the Vallejo Ferry Terminal. Race Course: Zig-zag course in front of the breakwater at the Berkeley Marina. Best Viewing: The end of Spinnaker Way. Awards Location: Caesar Chavez Park, across Spinnaker Way from the Marina. If traveling North on I-580or I-80: Take Interstate 80 to Powell St. Take a left under the freeway and right onto the Frontage Rd. Follow the Frontage Rd. to University Ave. Seabreeze Market is on the corner. Take a left onto University toward the Bay. At the first stop sign, Marina Blvd., follow the directions below. If traveling North on I-880: Take the University Ave. exit and the lower/right-hand ramp that goes under the overpass. Take a right at the first intersection (Hearst) go up Hearst to 6th St. (light) take a right onto 6th and the next right onto University towards the Bay. Go over the overpass and continue straight to the intersection with Marina Blvd, then follow the directions below. Once at the intersection of University Ave and Marina Blvd., turn right on to Marina Blvd. Turn left on Spinnaker Way and go to the end of Spinnaker to view the race. Caesar Chavez Park is on the right. Click here to create your own driving directions to/from Spinaker Way at the Berkeley Marina. Race Course: Somewhere on the North Shore. You never know where from year to year � sometimes not even until race day! Race Course: Quarter mile sprint In the Mare Island Channel along the Waterfront Promenade.